Everybody knows them, the heroes in the organization. They are the ones that know all the ins and outs of the product, architecture, frameworks, infrastructure and the cleaning lady’s schedule. They are the ones that stay late to finish the last tasks before the sprint ends, that refactor the code in the middle of the night and that have worked over night to fix that critical bug. The hero is often put on a pedestal, protected, worshipped and treated very carefully knowing that if they leave, the entire company will collapse. Almost nobody considers that the hero is actually a big impediment in the organisation, a risk and definitely a situation to avoid. Having a hero makes you company depending on one single person. What if this person goes on holiday, gets sick or leaves the company. This makes your company vulnerable and puts the hero into a position in which he or she can demand everything. In agile environments the hero undermines the self organization of your team. As soon as people have the feeling that the company sees a person as the hero within that company, they will start acting accordingly, accepting his estimates, never questioning his opinion and definitely not challenging him. The level of the hero will automatically become the limitation you won’t get past. The hero will put unhealthy pressure on people. What will the rest of the team do when the hero ignores the sustainable pace and works in the evening and in the night? Most likely they will feel obliged to do the same, putting them in a difficult position. The hero will hurt his / her peers self confidence. Imagine that you are a team member in an agile team. Now imagine that you log in in the morning and find your code modified or that task that you just picked up already finished. Heroes tend to be egoistic. There is a very unlikely chance that when working during the night, our hero picks up the less fun tasks from the taskboard. Your hero will chase people away. Heroes tend to achieve a position that is untouchable and unquestionable. Either people will accept that or people will walk away. Usually the people that will walk away are the ones that you would like to keep. 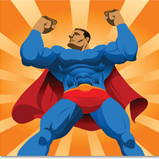 A lot of managers have the tendency to look for hero’s, often called key personnel. In my opinion having just a few people as key personnel is a flaw and a clear sign of bad leadership. Everybody in your organisation is key personnel. Creating a structure in which certain people are allowed to achieve the hero status is setting your organization up for a big problem, possibly even threatening the existence of the organization. Good leaders create an environment where the team as a whole is valued and appreciated, not just a few individuals.